Cartilage repair addresses several facets of the diversity in our present approaches to regenerate articulating surfaces. The following chapter now summarizes several promising options to engineer articular cartilage-like constructs, ranging from applying biological factors and/or mechanical, magnetic, or even electrical stimuli. The paradigm of cartilage tissue engineering classically comprises three pillars: cells, scaffolds, and signals. 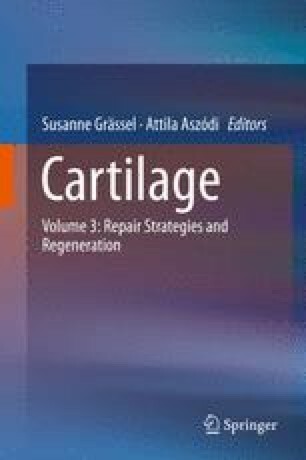 As cell sources for cartilage repair are addressed by other chapters in this volume, the next pages will focus on the two remaining pillars: first, due to their importance for the subsequent tissue engineering path, scaffold-free and scaffold-based applications are distinguished. Although most classical techniques in the field are scaffold based, relative more attention is now paid to emerging scaffold-free methods as articular cartilage repair constructs. Only proper tissue organization will permit long-term functional durability, and mimicking tissue growth without artificial support structures holds a lot of potential. While the extracellular matrix is an integral aspect of the tissue properties, it also impedes the integration of the repair construct into the surrounding host tissue. Several approaches to tackle this dilemma are depicted. The importance to develop bioreactors is also emphasized as they are inevitable for the reproducible application of sophisticated mechanobiological stimulation regimes. In this context, the contribution of selected growth factors is described. Towards the end of the present chapter, the importance of integrating multiple of these parameters into multimodal concepts for achieving phenotypic stability of the engineered cartilage-like constructs is addressed. Funding from the START-Program (Grant No. 691513) of the Faculty of Medicine, RWTH Aachen, the Umbrella Research Cooperation (Grant No. 700116), and the D-Board Consortium, which has received funding from the European Union’s Seventh Framework Programme for Research, Technological Development, and Demonstration under Grant Agreement No. 305815, is acknowledged.